The dangers at the Hinder and Hibberson Street intersection in the Gungahlin Town Centre must be prioritised as a matter of urgency by Minister Shane Rattenbury, Member for Molonglo Giulia Jones said today. “There have been 66 crashes at the Hinder and Hibberson Street intersection in the past seven years, including more this month, and I will be raising the issue in the Legislative Assembly today,” Mrs Jones said. “In his response to my pressing of the issue earlier this year, Minister Rattenbury told me crash statistics at this intersection put it outside the top 100 similar intersections in the ACT. How bad does it have to get before this location gets any attention? “I know from my time living in Gungahlin that there are major visibility issues at this intersection and that it’s seriously problematic for drivers. “How many accidents have to occur at this intersection before Minister Rattenbury will act? People need to feel safe when travelling on Canberra’s roads,” Mrs Jones concluded. The two maps above show the core problem. You have Flemmington Road running right into the main shopping street. The shopping street creates a bottle neck, cars turning off Hinder Street get impatient and take risks. End result accident. 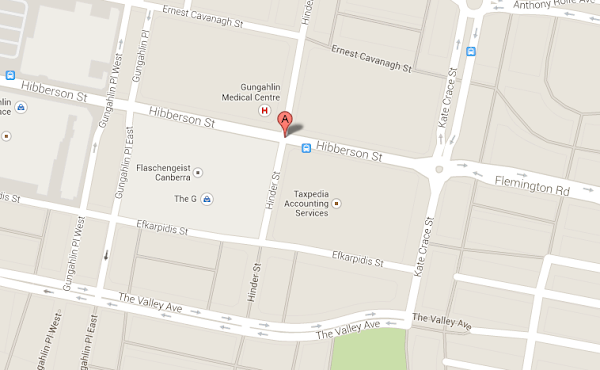 It is far too late now of course but Flemmington Road should never have lead directly onto Hibberson Street. It should have kept on going around the back down what is Anthony Rolf and line up with Mirrabei Drive and formed the town centre border. Then the town centre could have had all the higher density housing it desires with the main road bypassing rather than going smack bang through the main street and really going nowhere in the end. Oh – has one of Giulia’s relatives had an accident there? I was going to say that I can’t remember Flashengeist ever being there. But the power of google has recalled the place that sold coloured ethanol. Shortlived and rightfully so. That intersection is pretty bad but exacerbated by the damn awful drivers that seem to be infesting Canberra these days. So that’s a crash every (approx) 38 days. I could point her to a bunch of other places *cough* Tuggeranong Parkway *cough* that have crashes a lot more frequently and need more urgent attention. I’d say the answer to that is “More accidents than other 100 odd intersections” I think this is clearly the case of her being inconvenienced by crashes there, so she feels the need to flex her political muscle to have something changed. Why else wouldn’t she fight for every other intersection in her electorate equally? She lives in Weston Creek. Sorry, I stand corrected. Her former area of residence. Flaschengeist is long gone – but Guilia is right – that intersection is a dud and would be a lot easier to fix than the parkway etc – I think it needs traffic lights, or left turn only. She appears to be the queen of the ‘big’ issues so far! and the top map must be pretty old or out of date, I am pretty sure that Flashengeist hasn’t been there for years (but I could be corrected on this by someone north of the lake). maybe she should focus more on the selfish gits who park really badly…..
oops… ooooohhhhhh! that’s right – she is one of them…. Ahh Sim City: Gungahlin Edition, with their constant requests for pools, movie theatres, office buildings, functional roads and intersections, NBN, light rail etc. Though I happen to agree with this one. People are particularly indecisive at this intersection and it would be very easily fixed with a small roundabout. There goes my hero, watch her as she goes.